Frazier Cycling provides customized training programs and cycling-related services for cyclists of all levels and abilities. Our results-based performance programs target your goals, your schedule and your needs. We are experts and have trained all skill levels from elite athletes, to beginners to the physically challenged. 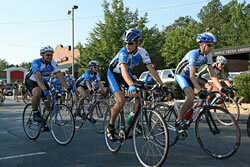 Frazier Cycling offers the opportunity to cycle with an organized cycling group, Frazier Cycling Partners. Skill level of members vary and rides are based on grouping cyclists with equally skilled riders. 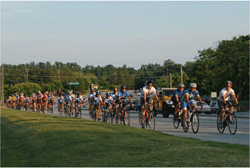 Several times a year there are “social” rides in which all members can participate together. Develop junior cyclists with a focus on principles and values; good sportsmanship, attitude and teamwork. When we started our program in 1992, we wanted to include as many cyclists as possible for improvement and success. Unlike other programs and cycling organizations, we do not target only the gifted cyclist. We look for candidates who have a good attitude and an interest in cycling. Coach Frazier and his Frazier Cycling Partners are anxious to help you become a SERIOUS CYCLIST! We can help you get there! Contact us now and let’s get cycling!